We have you covered. Today, tomorrow and the next time. We are one of the few custom window treatment companies serving Los Angeles that has a Contractor’s License (#89857), one million dollar liability insurance policy​. This might sound like a given for each company to have…but check around, not every company is this thorough. And, Cory is the one with her contractor’s license. Go figure. The Jacoby Company​, Inc. is a husband, Wife, and Daughter team of Gary, Cory and Bree Jacoby. We’re a family company and we treat our customers with care. 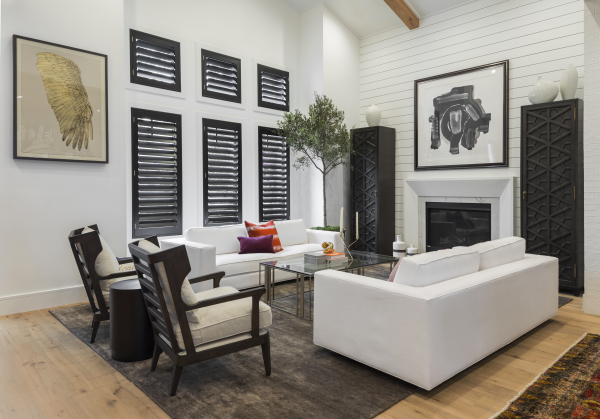 Located in Los Angeles and serving greater Southern California, we’ve been in the business of creating fabulous window treatments, luxurious draperies, sensible shades and scintillating shutters since 1980 and we love it! We go to every trade show to gain the newest and greatest knowledge, which is such an asset when we are designing at the home. We work hand-in-glove—Cory and Bree do all the designs and Gary installs… simple as that! Imagine having a company that is only a “text” away. We make it easy to contact us, easy to do business with and most of all, we are happy to have you in our circle of clients. ​We also welcome out of state Interior Designers to help them with their “out of state” clients. They also love the easy way we communicate and most of all they love the “white glove” service we provide to their clients. We are an extension of their company and we are honored to be just that. 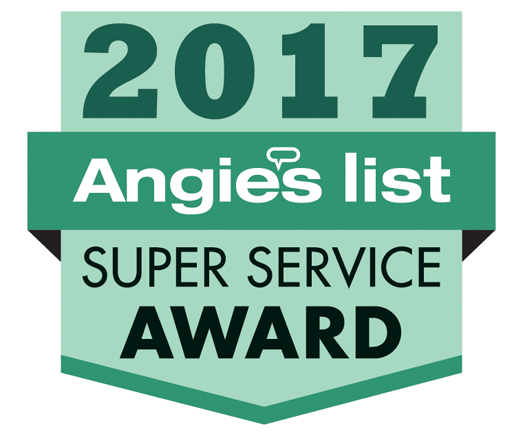 Check out our profile on Houzz, Yelp and Angie’s List for your reference. Our clients are happy. We have won awards year after year for providing excellent service and fabulous designs your friends are going to talk about! .​ Making you happy, really happy, is our goal. Let us guide you the right way in making those hard decisions. After all, we have been at this for a year or two, or 30. Smart homes are a wave of the future and this is just the beginning. All of the new homes are programmed so we need to have the resources and the knowledge to make this all work. There are many apps for smart phones that allow the treatments to be operated from afar and we can make that happen. Again, it goes back to our dedication to keeping up with technology. If you like the modern, sleek design…let’s do it. If you want blackout draperies that will operate by a push of a button, we can do it. If you want to put your window treatments on a timer…let’s do that too. We take pride in our business and in our top-quality products, exciting designs and fast, friendly, professional service. We handle the whole process as a team (along with our wonderful assistant, Tricia), from start to finish, so no stranger will ever enter your home. You’ll have security, beauty and the finest in design, installation and materials. We get you what you want—and sometimes more than you dreamed you could have—in half the time. We do custom design and installation of all types of window coverings and treatments for every purpose. We work with any budget. With our unique mobile service and close relationships with top manufacturers and designers, we get wonderful things at amazing prices. We use our sources to design the best window treatments possible that will stand the test of time. We love to exceed your expectations. See, we believe in fairy tale endings for our clients, too! This is a company that is worthy of a 5 star review!!!!! We have been clients of the Jacoby Company for more than a decade. Cory and Gary are a dream team who truly listen to what you want and envision for your home and then make it happen in a way that is both budget friendly and customized just to your own personal taste. I have recommended this company to all our friends and everyone has been an extremely satisfied customer!!!!!!! They stand behind their products and installation, which in today's world is worth its weight in gold! After twelve years of having the same shades we decided to change our look and upgrade our decor and window treatments. We decided to call Cory & Gary who had done the shades before. Our new window treatment were perfect and changed the look of our house to more of our taste for today. We are so delighted with the new look and the installation was so efficient. The experience was so easy , just as it was years ago! Cory & Gary are an amazing duo! Cory came to my house and used her tape measure like a knight with a sword! In no time at all she had all the measurements, then she did calculations that looked like she was building a rocket ship! She recommended colors and options as if I were picking out a suit for my wedding, and within a very short time frame she was off with an order for product! Within a few weeks the wizard Gary appeared with shades, tools, and super strength energy to put up shades on every window in the house! It's like having a whole new house! I wake up every morning now looking at my windows and wondering why I waited so long to call them! Natural light + Privacy = Window Happiness! I highly recommend them and I will use them again for my other projects! Cory and Gary are wonderful people. They are professional, efficient and experienced with great taste. But there is this little subtle of the warmth they bring to you, made you feel like you are just working with a friend or even a family member. And Tricia, the office manager, she follows up with every appointment and always on top of it. I only wish all the office managers in the world could be like that, then there would be much less anger and stress, maybe we could even achieve world peace! I loved my experience with Jacoby Company. I had so many compliment of the shutters from all over the world when I post the pictures. And my husband, who likes to notice little details really like the kitchen corner where the rollup shades, lemon ice paint and light merged together. I think am on the way to "you give a woman a house, she turns it into a home". Thank you so much, everybody in Jacoby Company! Found you guys on Yelp so I'm back to say how happy I am that I did. You are a fantastic family and your work is perfect. The time you took with all of my projects was so appreciated. Gary, you have the nicest attitude and you are so incredibly sweet. You stay until I am happy with a smile on your face. Cory you are a great ball of energy with fabulous taste. I still can't believe how fast we picked fabric for my rooms. I've never picked fabric so fast with anyone. They look absolutely wonderful. Can't believe I waited so long to replace my old drapery. Thank you for being talented, kind and reliable. I hope to see you soon for more!!! Cory and Gary did a great job with my various window treatments! I had very little experience with window décor and Cory happily (and patiently) explained the pros and cons of each style. I ended up going with a wider variety than i anticipated, from roman to french pleat to motorized roll up, all appropriately placed for the function of each room. They are also such lovely people! In love with our new living room shutters. Jacoby Co. were such a joy to work with. The entire staff are extremely professional, quick and efficient. I couldn't be happier with our new living room look and feel. If you're looking for window coverings that bring warmth, quality and elegance you definitely want to call Jacoby Co. I don't normally write a review..But I had such a great experience I had to share. I contacted the Jacoby's to give me an estimate for window coverings for my entire home. Cory came out and walked the house with me we discussed my needs for each room. She prepared a proposal for me giving different options for each room and what her recommendation was for each. She worked with my budget and helped me to separate my plan into 2 phases. The first phase was installed this weekend and it looks great and installed in less than 2 weeks. I had real wood shutters installed throughout the house. Their Shutter installer really had an eye for detail and did a wonderful job. Next will be the full draperies in the master and side panels in living and dining rooms. Gary , Cory's husband already took final measurements for the draperies and he does the installation himself.. I will post pictures when completed. Thank you Cory for all your advise. I am looking forward to the next phase. Concerning a 10 foot vertical blind that covered the exit onto the patio, the mechanism that turns the vertical pieces from open to close was not working properly. I live in Arizona, but the building I own is in Los Angeles. It was initially thought to be a simple fix by just re-adjusting the gearing on the top, but being over 20 years old, the blind, upon visual inspection, required the full ten foot mechanism (sorry, but I do not know the technical language for these parts). The gentleman, Gary Jacoby, made an appointment with the tenant, was extremely flexible, and a date was chosen for him to come to the apartment. Immediately after his inspection of the problem, he called me in Tucson to discuss the problem. We set up a repair date, confirmed it with the tenant and came out and fixed the problem very quickly. My tenant was so impressed with Gary and his work ethic and his personality that he texted me and told me how great this experience was. As I mentioned above, I could not have been more pleased. Gary Jacoby explained in detail the reasons he could not fix the original piece and why, after 20 years, the top "slider" mechanism should be replaced. I would definitely would use him again. Have every confidence in the world about this man's forthrightness and honesty. He is very friendly and pleasant to be around. First, Cory came to our house and showed me many options. I wasn't exactly sure what would be best in each room. Then I was having difficulty making a decision with regard to some of the windows. She was very patient, made good suggestions, and pointed out the most economical and reasonable options. Gary did the installation of the blinds and they have an installer for the shutters. All was perfect. We have had shutters installed in our previous house on 2 occasions. The first was ok, the second was very mediocre. These are the best - they are so well made and the job was done beautifully. The blinds are perfect. In addition, Cory and Gary are very enjoyable to work with. They make a great team! I trust them, appreciate the work done, and would hire them again in a miinute. I recently had new windows installed in my bedroom and was in need of an additional window treatment to add privacy. I already had lace curtains but wanted something that would still allow light and also provide for privacy when I wanted it. I called Jacoby Co. and Cory was able to come out within a day or so. Cory was delightful to work with. She immediately had suggestions and knew what would work according to what we had discussed. She is very knowledgeable ,creative , talented , and easy to work with. Her choice/suggestion for my particular situation was not only practical, but would definitely keep in line with the decor of my room. We discussed fabric and trim choices and the order was placed. A few weeks later, I was called and informed that my shades were ready to be installed. Gary came out and did an excellent job installing them, fast and easy. Not only did the shades operate with ease, but the look totally added the finishing touch to my windows and enhanced the look of my room tremendously. I was so happy and pleased with this choice of treatment , the quality, service and installation. Cory and Gary do feel like family, they are amazing people. You definitley feel the personal concern and attention they give to you, and their desire to provide the best that they can for each customer and situation. Yes, the cost was more than what I had expected, but since I was only doing these 3 windows, I decided to go with the expertsie and proven excellent customer ratings of this company and get what I really wanted. I am glad that I did. You will not find a more pleasant and rewarding experience then working with Cory ,Gary and Company . I am so happy that I checked with Angie's List and found Jacoby Co.
Jacoby Company has come through again! The new window treatments in our bathroom add sophistication and understated elegance to the room. Cory understood exactly what we were trying to achieve, and helped us choose the perfect fabric. Gary was efficient and exacting in his installation. Both were kind and warm. It's the same service we got last time, and it ensures that we will call them next time!! I was very tired of my tangled, dirty, broken, falling apart vertical blinds on all four windows in my condo. Cory came in for the estimate and couldn't be more sweet or motherly (she can spot a struggling kid with a property that needs major help a mile away). She was quick, clear and helpful. She even gave me the Angie's coupon that I didn't even notice on the site (and that I later forgot that she had even applied! Sorry Cory!) A few weeks later after the custom blinds were finally in, Gary came in to do the install. Super fast, super clean, faster than what he even estimated. The new shades look great and work great. Definitely recommend them and will use them in future projects. I had an amazing experience with Cory Jacoby. Her ideas, professionalism, punctuality and responsiveness were fantastic. She came to the estimate with all of her fabric samples and spent quality time with me going over my drapery needs. I would definitely recommend her - especially because she does come with a wealth of ideas, and if you aren't sure what you're looking for, she will steer you in the right direction. Unfortunately, we weren't able to use her company because of an unforeseen financial situation, but when we can, I would definitely have her on my list to call to assist with my drapery needs. I had no preconceived notions of what I wanted to do to replace the ugly, old curtains that had existed as I just repainted the kitchen. Gary came out just before the holidays and suggested blinds. I am absolutely astonished at how good they look! Warm, functional/practical and allows plenty of light. There is only one minor adjustment that I need addressed, but am extremely please! Additionally, Gary happened to notice some fabric swatches I had laid out and gave me some great direction on a sectional upholstery project. I might have Jacoby involved in this; hadn't realized they do this sort of work, too. Jacoby Company is one of the most professional services I have ever had. It is a family business which takes their work seriously. They were prompt in responding to my requests, came to my home to do the measuring, had the product completed in a timely fashion and installed the product perfectly. The shades look great and the quality is excellent. One of the high lights of their service is their personal touch. They make the client feel part of the family too. I highly recommend this service to anyone looking for window coverings! Thanks again for absolutely everything. We are just so happy, and yes, the living room is incredible. I can't decide which is my favorite room! They are all so beautiful. I love the guest room. I will work on finding the right duvet and shams, and then I will get in touch about the additional pillows. I really appreciate that! They will be done staining our closet on Saturday and then we will make up our bed too, I am so excited to see how it looks. With phase one (of three) now complete and three rooms transformed, it is fair to say that Sabina and I have been totally inspired. From a google search pointing us to "best luxury window treatments in LA" to the blog entry on Chiang Mai Dragon we have loved working with Cory and Gary. As busy, and sometimes frantic, customers I know we taxed Cory's patience but she stuck with us and helped to make the process easy. She worked with us when we wanted a hand in design and selection and just handled things when we needed to step away. Gary was a pro on everything technical and, as a fellow couple who work together in a small company, we loved watching the two of them interact and solve problems. Finally, what probably differentiates Cory and Gary most is their commitment to service excellence and that makes them exceedingly rare and truly outstanding. We would unequivocally recommend Jacoby Company to anyone looking for the best. I met with Cory after going through an exhausting ordeal with Smith and Noble. I cannot begin to explain the difference in how I was treated, and the difference in the expertise that I received with Cory. She was warm, professional and extremely knowledgeable. She even took the time give me a few decorating tips that I sorely needed! 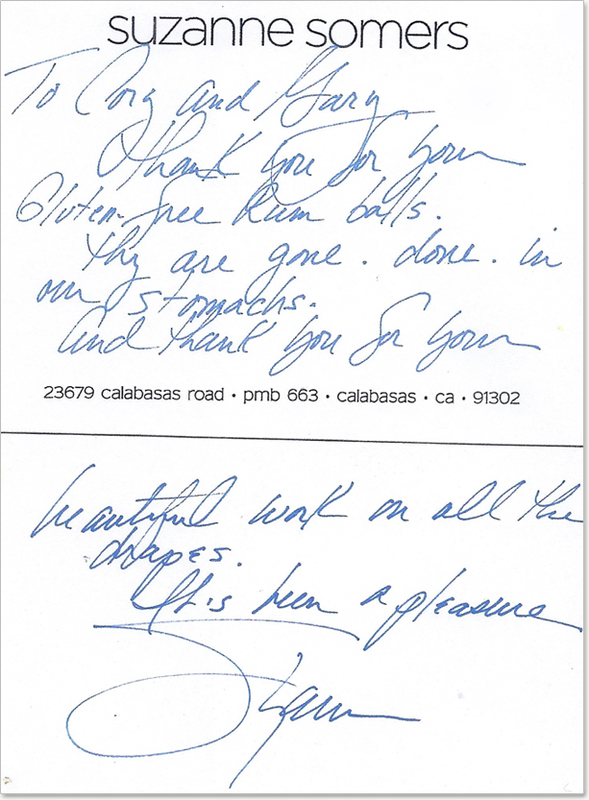 Gary was equally wonderful when he came to do the installation of our window treatments. I am so very happy with how everything turned out, and I would highly recommend Cory and Gary to anyone who is looking at window treatments for their home. A few weeks later, I was called and informed that my shades were ready to be installed. Gary came out and did an excellent job installing them, fast and easy. Not only did the shades operate with ease, but the look totally added the finishing touch to my windows and enhanced the look of my room tremendously. I was so happy and pleased with this choice of treatment , the quality, service and installation. Cory and Gary do feel like family, they are amazing people. You definitely feel the personal concern and attention they give to you, and their desire to provide the best that they can for each customer and situation. Yes, the cost was more than what I had expected, but since I was only doing these 3 windows, I decided to go with the expertise and proven excellent customer ratings of this company and get what I really wanted. I am glad that I did. Cory and Gary do huge jobs, and the fact that they have both taken so much time to help us has been incredible. I never feel less important than those clients in Beverly Hills paying huge sums of money. They have our best interest in mind as well as our budget. I truly know that we could not do this without them! Bottom line, they are trustworthy, hardworking, creative, and passionate. This is what I look for in any type of service I seek, and this is what I have found with the Jacoby Company! They say buying a home and moving into a new home are two of life's most stressful experiences. A third must surely be *decorating* that home. My girlfriend and I are deeply in love, and yet there are those times when it comes to choosing where to place the television...well, let's just say it can be trying! Which is WHY Cory and Gary were such a godsend. From phone call to consultation through installation, they made a potentially stressful and expensive process pleasant AND affordable. They are friendly, charming, extremely professional - and most importantly of all, they do BEAUTIFUL work. Cory's taste is impeccable, and she helped immensely in guiding us to a selection of window treatments that suited both our personalities and our pocketbooks. Everything was cut, sewn, and built to order, so it took a few weeks for manufacturing, but everything arrived exactly when they promised it would and Gary put them up quickly and with real attention to detail. Cory then returned to ensure that the whole 'look' was perfect - as it was. Of all the manifold experiences we've now had as new homeowners, I can say without a doubt this was the smoothest, easiest, and best. Thanks, Cory and Gary! We recently moved in to a large, newly built home. The task of decorating was daunting at best and we had only a general sense of what we wanted. I found Jacoby Company after a careful search on Angie's List. I immediately came to appreciate the owner/designer, Cory's knowledge, experience and no-nonsense approach to creating the relaxed yet classic style we hoped to achieve. We discovered Cory to be fun and delightful to work with as well as professional and trustworthy. She paid attention to detail and listened to every one of our concerns. Her business partner and husband Gary personally coordinates all installations and is equally as delightful and professional. All jobs will have little glitches along the way and we found Jacoby Company to be very attentive and concerned about all aspects of our job and most especially creating and delivering an outstanding product and service. We whole heartedly recommend Jacoby Company! We recently updated the window treatments throughout our home, and thanks to Jacoby Company (Cory and Gary, a great husband and wife team!) it was a fantastic experience with fabulous results. From the design (with Cory) through the installation (with Gary), every detail went smoothly and professionally. Cory had great fresh design ideas and steered us comfortably towards great options. Every treatment came out perfectly - from rods and sheers, to drapes, blinds and valances. We completed the master bedroom, the guest bedroom, the living and dining rooms and the den. Everything looks spectacular. The treatments complement and highlight the overall design of each room. In the past, installations have always been a problem for us. Nothing ever seemed to go in quite right. But, Gary had every treatment installed perfectly (even with some tricky challenges to overcome!) without any problems at all. We would highly recommend Cory and Gary to anyone that wants beautiful products, great service and perfect results. Gary & Cory are such a pleasure to work with. Not only do they bring their expertise and knowledge to the table, but they do it class and style. They understand a broad range of the need for sound proofing in drapes for post houses which is what we needed. Our company loves the fact that they come to you. It makes the process easy, efficient and enjoyable. Love these two and we always enjoy when they stop by. We highly recommend Jacoby Company. “Cory comes, does the measurements, brings samples so you can see what the materials will look like. Then Gary, her husband does the installation, and does a great job. I was very happy with the results, even though I thought I wanted a different kind of window covering. Cory was able to explain why that would not do what I wanted it to do, and in a way that the other person who came to give me an estimate was not able to do. “You will get the best of the best if you choose the Jacoby Company for your window treatments and home design projects. Cory and Gary have taken our house from the ordinary level to to the eye opening ‘Wow!! !’ level when people come to visit us. I have heard comments such as : ‘Those draperies are magnificent – I have never seen anything like that before.’ and ‘The design is so unusual and the fabric so spectacular.’ And on and on. Furthermore, Cory and Gary spend time making sure that the design is right for you and your home, they work with you on pricing AND they will do other design work so that your home is coordinated throughout in terms of color, fabric, furniture, etc. Thank you so much for your calls yesterday and today. 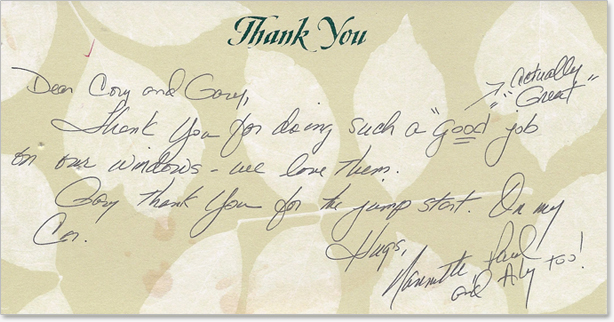 I want you to know that I greatly appreciate the care you have taken with us as clients – and friends. I had tears in my eyes when I heard your message about replacing both shades. I certainly didn’t mean to underestimate you! I haven’t felt any stress about the whole situation, but nonetheless was overwhelmed with gratitude for the way you intervened on my behalf – without even being asked – to make things right you and Gary are true professionals. What a blessing to have met you! From the first time I have met you, you have far exceeded my expectations. “One of my rooms needed an update desperately, I called Cory Jacoby over and she helped me pick my paint colors, my furniture, paintings for my walls and my great looking window coverings. My room is amazing, warm, and beautiful. Thank you so very much for being who you are. You both worked around my husband and my hellish schedules and never complained. When I was sure I knew what I wanted you “gently” showed me the way and we just could not be more thrilled. Everyday I walk into my living room and formal dining room and sit there and really can’t believe it all looks so beautiful. The workmanship of the drapes, the fabric, the attention to detail is exactly prefect. We really couldn’t be happier which is why we are now doing the rest of our house (so I will be calling you again soon!). Thank you. Oh, and on top of everything you are both such nice people. After buying a new home, I went through several interior decorators and quickly became fed up! I was about to give up and live in my partially furnished house but realized I at least needed some window treatments. I contacted a couple of window treatment companies and set up consultations. After meeting with several people, my next appointment was with Cory Jacoby. By this point, I was so frustrated I considered cancelling the appointment and just putting sheets over my windows – but I kept my appointment and within minutes of meeting Cory, I realized there was hope after all! She listened to what I wanted and offered various suggestions that she thought I would like. Cory was not pushy, but she definitely let me know when she felt strongly about what would and would not look good in my house. Even though I liked Cory and felt confident that with her help I had my the right selections, I decided to do one room only. I feel very strongly about customer service and professionalism and did not want to invest a lot of money into a company that did not have great customer service. Within weeks I received a call to install my new window treatments. Gary Jacoby, who did the installation, was great. He worked with me on exactly where I wanted everything placed and even returned when I later changed my mind about the placement of my drapes! Since then I have worked with Cory and Gary on the rest of my house, and I have been completely satisfied every step of the way. Everyone at Jacoby Company has been very helpful and have always been a pleasure to deal with. I highly recommend Jacoby Company to anyone interested in working with experienced professionals who provide great customer service and quality products. Cory was extremely helpful in finding the perfect shades to complement the style of our house. The service was excellent from beginning to end. Everything was ordered and installed in a timely manner. Gary did a great job with installations and made sure each piece fit the space perfectly. 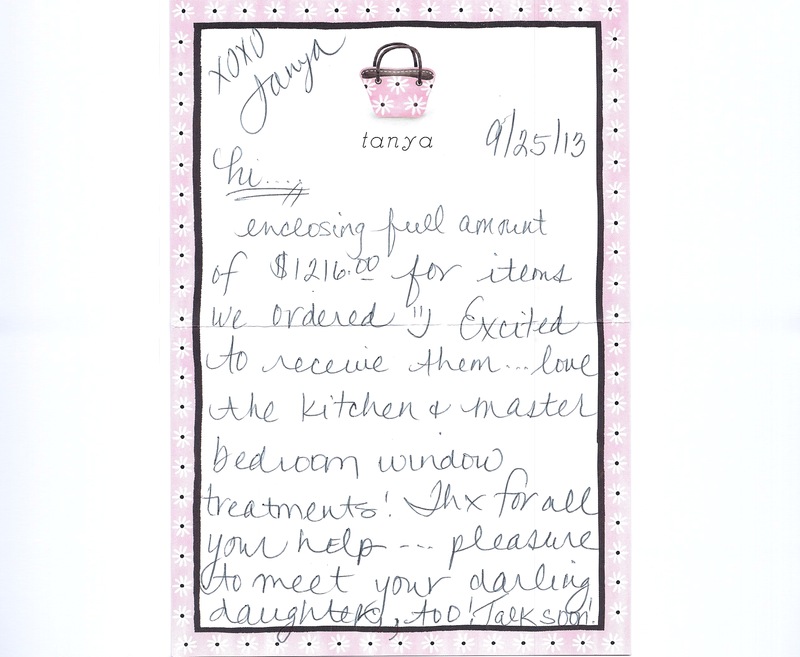 Everyone that my husband and I had the pleasure of dealing with were warm, patient, and helpful every step of the way. We would definitely recommend Jacoby Company and plan to use them again in the future.